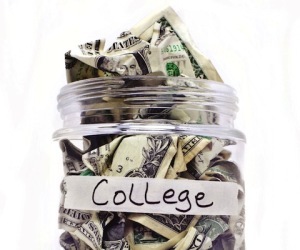 Home › FAQ › How Much Should You Save For College? To figure out how much you should save for college, first you need to know how long you have before enrollment. If you’re putting college money away for your children, understand that the cost of tuition, room and board will increase by about 6 percent per year due to inflation, so a $33,000 education today will cost around $95,000 in 18 years, according to USA Today. The good news is that you can offset this inflation with the interest you earn on your college savings. By starting a 529 college savings plan, you can invest in a mix of stocks and bonds that return around 7 to 10 percent in interest, and the gains are tax deductible. If you are saving money for your own education, you may have a hard time putting away the $400 or $500 per month for the next 10 years to pay the whole bill. However, if you don’t earn enough money to pay for your own education, you can apply for federal financial aid, which can pay for all or part of your tuition, supplies and living expenses, depending on how much money you make. If you’re saving for your own education, any amount you save will help, but you most likely won’t be able to save enough to pay the entire cost. If you’re a parent saving for your child’s education, the investment you make depends on how soon your child will be going off to college. If he or she was just born, you can afford to invest aggressively and earn a 10-percent or higher return. The closer you get to enrollment day, the more conservative you will want to be with your investment. Bonds are a stable product to invest in as they carry very little risk but only return about 2 percent, on average. With government-insured bonds, you are practically guaranteed to receive your principal amount plus the interest you were quoted when you bought the bonds. If you have a little more time to save, consider investing in stocks. On average, you can expect to earn about 10 percent of your investment in stocks, if you diversify your portfolio. Another option is to invest in a mutual fund, with a mix of stocks and bonds. Your investment will be less at risk and you will likely earn more in interest than with bonds alone. A 529 savings plan has an option to invest in a mutual fund, and you can withdraw money from the account without a penalty in most cases. If you put away $400 per month for 18 years, earning 7 percent interest over that time, you’ll have over $90,000 for your child’s education. You may want to consider letting your child pay for some expenses so that he or she learns how to manage money before graduation. Your child can pay part of the tuition or expenses through grants, subsidized loans or work-study opportunities by filling out the FAFSA form. according to the Washington Post. Applying for scholarships is another excellent way to decrease college costs. The cost of tuition and college expenses is continuing to increase, and combined with inflation, in 18 years, college costs will be several times higher than they are today. The good news is that the salaries of college graduates will increase to reflect those economic changes, which is helpful when deciding how much you should save for college.